Explore the dramatic setting of an adults-only, all-inclusive oasis, set along an untouched peninsula between the Caribbean and wetlands preserve. 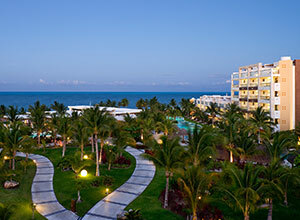 Excellence Playa Mujeres' setting is a stunning as it is exclusive, on a two-mile stretch of powdery virgin white sand moments from the nightlife of Cancun and Cancun International Airport. This adults only retreat sits near an island marina and a spectacular Greg Norman signature golf course. The world-class Miile Spawill take your breathe away--and your cares. Ten international restaurants will delight you with gourmet cuisine. And the all-inclusive activities, will keep you entertained.